Today on facebook I saw several people put a caveat in front of their workout posts. Things like " I know its not great but...." Why do that to yourself? Don't get me wrong, I get it. I have done that too and I'm not asking why for you to tell me but I want you to ask yourself why you do that. One friend in particular just had knee surgery and I know she is frustrated and feeling down but the exercise she did was awesome and the only reason for it not looking awesome when written down in the form of a status update is if you were comparing it to some ideal whether it is comparing to someone else or some kind of expectation you have put on yourself. I don't want her to tell me its not great because frankly she is the only one thinking it. It sets a negative tone and makes wanting to continue to try all the more difficult to get up and do it the next time. I read that and think "whats not great about it? Sounds great to me..."
When I am feeling self depricating and recognize it I choose to put "this is where I am right now with this pose." as my descriptor. It is not good or bad. There is no good or bad in this circumstance. Growth and development are unbiased and only care about where you are right now and how to keep growing and learning. Saying things like "I know its not great but..." closes the door to growth a little bit each time. I get frustrated too. I see people running all these miles and people doing these lovely yoga poses and some of them seem to pick it up and progress so damn fast and I feel inadequate. I have to consciously make an effort to change my inner dialogue and what words I choose to put out there in the world. Its not like you have to fake enthusiasm if its not there but telling it like it is is cathartic in its own right. It allows you to let go of expectations, not goals but expectations, and move on even though you might be frustrated still. There is no arguing or negativity attached to "this is where I am at right now with this." Its also a lovely place to be able to look back to later on to gauge your progress. 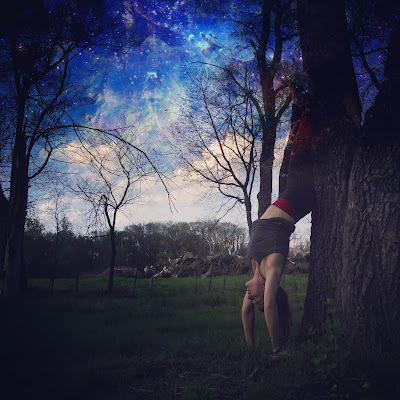 Many of these instagram challenges that I love so much are an eclectic group of yoga lovers who are at very different points in their yoga journey and we all post pictures together. We put ourselves out there and I think that those people just starting out are just as inspiring to watch in their journey as the people who are super bendy and seemingly perfect. Inspiration is the key word there. Some days I have to walk away from my phone and just chill out with myself and MY PRACTICE because I have goals that I am working on and sometimes they get twisted into expectations and pressure and that sure does put a damper on the joy of what I do. So, my advice is to observe yourself, find your inner moxie so you can accept yourself for what you are, and start thinking in terms of "this is where I'm at right now in my journey." and being able to examine yourself without negativity and expectations to be something you are not right now. Work hard, be patient, and love what you do. Here are some firsts for me today. I'm pretty stoked about them! Conquering fear was the big step for a couple of these. I was too scared to even try before today. This is Day 15 of the #handstand365 challenge. I worked through the idea that I have to be straight up and down and away from a wall or tree to be "good". I can do whatever I damn well please and I had forgotten that. Once I decided to accept that I WANTED to practice with the tree I was free to do just that and be a little creative. The tree or a wall is nice because it allows me to work on staying up longer and not have to worry so much about balance. It frees my mind up to work on form. This one is called Flying Pigeon. I finally got my hips opened up enough to get my foot on my arm and then get that back leg straight. Sooooo many people are quite flexible in their hips and make it look easy peasy to do any kind of hip openers. THIS IS WHERE I AM AT RIGHT NOW and down the road it will make an awesome beginning picture! Some days where I am right now is better than the day before. Sometimes progress seems to be stuck and yet no matter the comparison, it doesn't change where I am right now whether I like it or not. 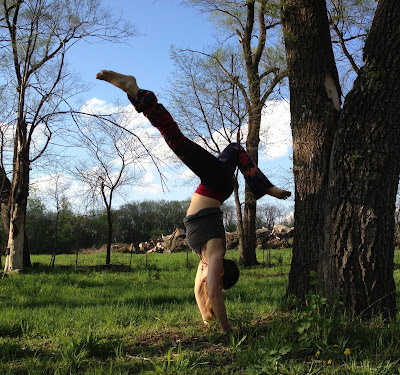 This hollowback handstand was my very first try. I have been too scared to try it for months now. I don't know what the difference was. I suppose I was feeling kind of pissy and I had sassy pants on so I just tried. My arms are very tight as well as my back so its a baby hollowback to test the waters and get some confidence. I am proud of myself for facing my fear. 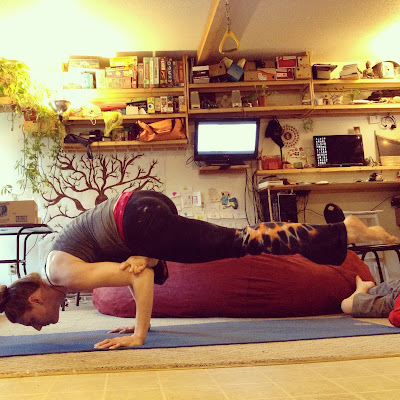 I also tried scorpion pose again from a forearm stand or Pincha Mayurasana and it felt fabulous but let me tell you I see people all the time touching their heads with their feet!! How awesome is that! Im not there yet and thats cool too. Where are you at right now? Do you sometimes find yourself putting a caveat before you report what you have been up to? Great post! I agree that we should embrace where we are and be damn proud of it too! so well said!! I think this is part of why I am ok with "bad runs"...they are just one run. I so get this and was thinking similar thoughts the past couple of days. And you're right, I'm OK with where I am right now with my practice and my running and my workouts. It's hard sometimes because of all the comparison that is inevitable but I think that's where yoga is helpful for me to step back and come back to me and my path. I LOVED seeing your pigeon fly last night. I love seeing everyone's progress on IG. It's pretty freaking amazing. I am pretty sure I have done that... thanks for pointing it out... great post! So much changes from day to day!